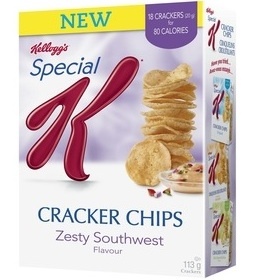 Special K Cracker Chips coupon can be found at Websaver.ca. This is a hidden coupon, so can only be access and added to your coupon list by visiting Websaver’s website and clicking on their Kellogg’s portal. Once you add this coupon to your list, create an account, and request your coupons to be mailed to your mailing address. With Websaver.ca, you must select at least 4 coupons before they mail it out. You can find the hidden coupon here. 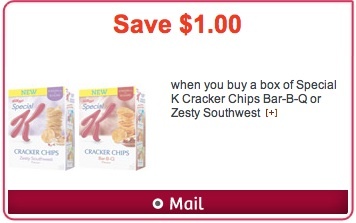 Kellogg’s coupon is to Save $1 when you buy a box of Special K Cracker Chips Bar-B-Q or Zesty Southwest. Sometimes snack time just calls for something, well, zestier. Meet Special K Zesty Southwest Flavour Cracker Chips, a celebration of tangy southwestern flavours with a satisfying crunch. Snack on 18 savoury crackers for 80 calories and feel great about your choice.